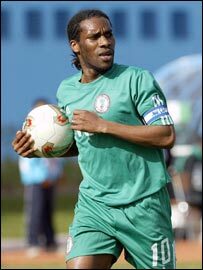 Jay-Jay Okocha has been named as the BBC's African Footballer of the Year for the second year in succession. The Nigeria captain, who plays for Bolton in the English Premiership, topped the poll ahead of Cameroon international Samuel Eto'o Fils. Votes were submitted by listeners to the BBC World Service's 'Fast Track' programme and the BBC's African language services. The majority were delivered via the African Football website. The gifted midfielder is the first player to win the award twice. He shone on the African stage during 2004 when he led his country to third place at the African Cup of Nations in Tunisia. It was a turbulent campaign for Nigeria, during which three prominent players were sent home and the side lost its opening game. However, scored four goals and was voted as the player of the competition. On his second BBC award, he told Fast Track: "I never thought I could win it again this year. "I appreciate this one more because it's been more difficult to retain the award and I've put in a lot of hard work to see that I retain it. "I'm very happy that I accomplished it and I appreciate all the people who voted for me." The BBC award has been running since 1992. Previous winners include Abedi Pele and Samuel Osei Kuffour of Ghana, Patrick Mboma of Cameroon, Senegal's El-Hadji Diouf, Nigeria's Emmanuel Amuneke and the entire Zambian side of 1993.